There is never a dull moment in her life, or so it seems. She is always so cheerful with smiles that not only touches your heart, but infects your soul with positive energy like a cool rushing breeze. She is like the sunshine on your rainy day. She is a light source that beams through your darkness and you can see the end is near when previously, it seemed so far away. Her name is Mrs. Andria Flax, a woman I have known for a number of years, crossing paths with her yes, because she is one of the senior members within the Human Resources Department at the organization for which I am currently employed, namely, the BVI Health Services Authority. She is very soft spoken, and it would seem that she doesn't know what it means to get angry, even if there is an occasion that would give rise to such. For kind words of encouragement, and to bring me hope, I could always count on her for giving that whether through an email or phone call. I've always welcomed such especially that it was during some low points in my work life when I really felt I just had enough, and I wanted to quit and to move on to another work place. I must however give credit to her for my stability and focus today within the organization. I recall about two years ago, I had cast a shadow of doubt on myself and my ability to write effectively until one day she communicated to me that I had very good writing skills, that I was detailed and gave such clarity in my writing and how much she actually enjoyed reading my correspondences. She helped to stir up and awaken the gift in me, and the flames began to burn brightly again. It is no surprise that she would do that because Mrs. Flax is someone who loves the Lord dearly. She is a wife, a mother of three adult children and a grandmother of two. 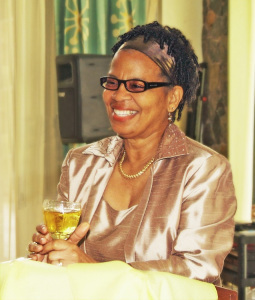 Among the things that she balances with her work life, is that she is currently a lay Minister of the St. George's Episcopal Church in Road Town, Tortola, Virgin Islands, aspiring to be a Deacon. She is a member of her church's Women's Prison Ministry and during her lunch break every Friday, would visit and minister to the women who are incarcerated at Her Majesty's Prison at Balsam's Ghut. Her many other accolades span across the airways. For four (4) years she hosted a two hour programme, namely, The Heart of Worship on Sunday afternoons that brought joy to the heart of many. Today, she is a member of her church's radio ministry, hosting 'The Quiet Heart,' a fifteen minute devotional programme she hosts whenever she is scheduled. Think you've heard enough about her? There is more. She loves writing poetry and it is actually one of her passion in life. She is an author who has penned two (2) books. She thrilled the entire territory of the Virgin Islands (British) when she launched her first book, 'The Way We Were' on April 15th 2010 at the Central Administration Complex on Wickham's Cay. The book took readers on a journey back to early times in the Virgin Islands as she gave vivid accounts of childhood days growing up in Road Town, along with the memories of her vacationing on one of the nearby islands, Peter Island, the birthplace of her mother. Later that same year, Sunday November 7th 2010, a new book was again launched, this time during the 8:30am service at the St. George's Episcopal (Anglican) Church called, 'Sharing the Vision - the Prayers, Promises and Poems of Andria Flax.' One of her poems, 'The Woman of Substance' was published earlier on my blog and in case you missed it, read it here. I am delighted and I am deliciously proud to present her to you - a Motivator, Mentor, a positive Role Model and a Mother who truly ROCKS! This article was written and published by this blog's owner Yvonne I. Wilson. This is an awesome tribute and by what you have written about her is befitting of the honor of a Mother who Rock! Job well done. Happy Mother's Day to you and all the Mothers around the world! Thank you for your kind words and your thoughtfulness. They mean a lot. God bless you! This is wonderful! She sounds like an inspirational and dynamic woman! You are blessed to have her in your world, Yvonne! Thank you for sharing this Mother Who ROCKS with us all! Hi Michelle, absolutely she is! I am blessed to really have someone like her in my world and it was indeed a pleasure to let the world know about her as well. Be blessed and do have a wonderful day on our special day upcoming. Much love! !